Douglas Clement has a characteristically excellent "Interview with Lawrence Katz" in The Region, from the Federal Reserve Bank of Minneapolis, published September 25, 2017. The subheading reads: "Harvard economist on the gender pay gap, fissuring workplaces and the importance of moving to a good neighborhood early in a child’s life." The interview offers lots to chew on. Here, I'll just pass along some of Katz's thoughts on a couple of points. "There is no systematic survey or data prior to the 1940s census on wages. But there was one very important employer in the United States who kept good records going back to the 1820s: the U.S. military when they were hiring civilian employees at forts all around the country. They would hire a blacksmith or clerk or day laborer and write down the employee’s characteristics and the wage they were paid and look at the gap between, for example, a clerical worker and a production worker working at a fort. "What the government has done—in the ’50s and ’60s, even into the ’70s—is invested heavily in high-quality colleges. Think of University of California campuses or Florida State. But since then, there’s been very little investment in expanding quality higher education. There’s increased crowding at community colleges and state universities, and states have greatly cut back on appropriations for higher education, particularly in the Great Recession. "The federal government has continued to have an important role, but it’s done it with flexible support through Pell grants targeted to low-income students. The problem is that we’ve had a surge of really low-quality colleges, and the worst of that is the for-profit sector, which Claudia, David Deming and I have studied. Particularly from the late ’90s to 2011 with this very large wage premium and funneling more federal funding into loans and Pell grants, a big part of that marginal growth—particularly for disadvantaged individuals—was at for-profit institutions for both associate’s degrees and bachelor’s degrees. "It’s been a bit of a disaster. Even though these for-profit institutions have tried to be up to date, very flexible, with high-quality online instruction, we have repeatedly found very little economic return to degree programs at for-profit institutions; instead, it’s become a massive debt trap. I think there is something to be said for the quality and capabilities, the faculty, the peer effects of a traditional public or private nonprofit university. "So, rather than what would’ve been the equivalent of the high school movement—developing more University of California campuses or more Florida public universities, so we weren’t rationing access to quality public colleges—we allowed the for-profit private sector to come in both as a nimble creative but also as an agile predator." "The demonstration program ran in five cities: Boston, Baltimore, Chicago, New York and Los Angeles. And the families eligible were living in public housing in the highest-poverty census tracts with an over 40 percent poverty rate. "Through a lottery, MTO allowed people to jump the queue to get housing vouchers providing housing support to live in an area of their choice. There were three groups: an experimental group that had to move to a low-poverty area if they wanted to move and received mobility counseling assistance as well, a second treatment group that received vouchers but wasn’t required to live in a low-poverty area, and a third group, the control group, who stayed where they were and kept their regular housing support. And we’ve been tracking them for 20 years. "And what we find for Moving to Opportunity is in the short run it clearly made the adults in the families happier and healthier. Measures of well-being and safety improved. There were big reductions in exposure to violence. But, economically, nothing much changed for the parents. "But it’s significant that at the time of the moves, at baseline, we asked people why they wanted to move, and very few said they were moving because they were looking for a better job. Almost always it was safety, wanting to get out of more violent areas, worried for their kids. Or it was trying to improve their housing conditions. "We saw huge improvements one year out, five years out, 10 to 15 years out in adult health. Large reductions in obesity, in depression, in diabetes and in biomarker indicators for long-term stress. This is sort of the equivalent of your best antidepressant and your best exercise and diet program in terms of long-run improvements in adult health and mental health! "When we looked at those same kids who didn’t look that different in their school performance but were less involved in violent crime as adolescents, they seemed to be assimilating types of social capital that may not show up on standardized tests, a sort of savvy of living in a different type of neighborhood. As Chetty, Hendren and I observe, the younger MTO children becoming adults, we see them more likely to go to and persist in college, and we see them much more likely to work, and an almost 40 percent impact in their mid-20s on earnings. It really looks like a powerful impact." An intriguing and important lesson here is that getting the full story can often involve looking at a broad array of outcome measures. For example, the parents of the low-income families didn't achieve higher incomes, but their stress levels and health improved dramatically. The children from the low-income families didn't have gains on school test scores, but they were less likely to be involved in crime, more likely to attend college, and more likely to work. For the typical young person, often it's not that their test scores and academic achievement need to be sky-high; after all, there's no escaping the arithmetical reality that the average student is going to have average scores! But young people who have social connectedness, a sense of possibility, and persistence to keep learning and growing can take their average academic performance and turn it into a successful adult life. Wealth is not income. Income is what you receive in a certain period of time, perhaps a year. Wealth adds up all of your assets--bank account, value of equity in home, retirement savings, and so on. A substantial portion of retirees have high wealth, but low income. A substantial portion of young professionals in their 30s have high income, but (once their outstanding debts are taken into account), little wealth. The canonical source for looking at US wealth patterns is the Survey of Consumer Finances, carried out triennially by the Federal Reserve. Results and highlights from the 2016 SCF appear in "Changes in U.S. Family Finances from 2013 to 2016: Evidence from the Survey of Consumer Finances," in the Federal Reserve Bulletin (Summer 2017, in an article with a double-handful of co-authors: Jesse Bricker, Lisa J. Dettling, Alice Henriques, Joanne W. Hsu, Lindsay Jacobs, Kevin B. Moore, Sarah Pack, John Sabelhaus, Jeffrey Thompson, and Richard A. Windle. The detailed survey results are here. The SCF and this article also look at patterns of income, but income data is readily available from other sources. Here, I'll focus on the discussion of wealth. Here's a figure with some evidence on the shifting distribution of wealth. 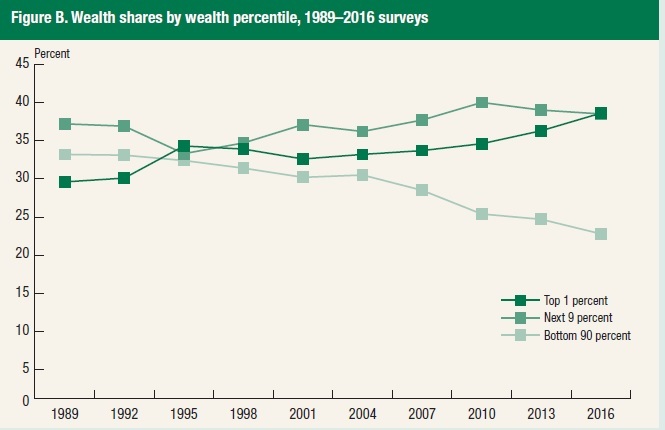 As the report explains: "The wealth share of the top 1 percent climbed from 36.3 percent in 2013 to 38.6 percent in 2016, slightly surpassing the wealth share of the next highest 9 percent of families combined (figure B). After rising over the second half of the 1990s and most of the 2000s, the wealth share of the next highest 9 percent of families has been falling since 2010, reaching 38.5 percent in 2016. 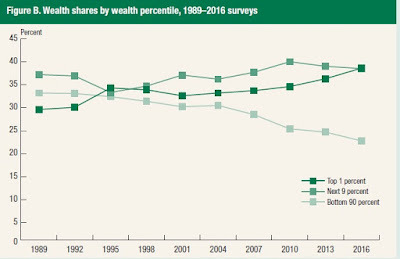 Similar to the situation with income, the wealth share of the bottom 90 percent of families has been falling over most of the past 25 years, dropping from 33.2 percent in 1989 to 22.8 percent in 2016." More from the report: "These patterns in net worth over the past several surveys were largely driven by the Great Recession and subsequent recovery in house and other asset prices. Declines in house prices in particular had a disproportionate effect on families in the middle of the net worth distribution, whose wealth portfolio is dominated by housing. Divergent trends in median and mean net worth over the past few surveys suggest substantial heterogeneity in wealth changes across families." The report offers a detailed breakdown of financial and nonfinancial assets (like home equity) held by families, and also of different types of debts. However, some definitional issues should be noted. For example, are the Social Security payments you expect to receive after retirement an "asset" for you? In a broad economic sense, the answer is clearly "yes." But people do not have ownership of that asset in the way that they own their retirement account or their house, and putting a number on the current value of that asset requires making a bunch of assumptions about future patterns of work and marriage and possible political changes to Social Security. Thus, it isn't included in the SCF measure of wealth. 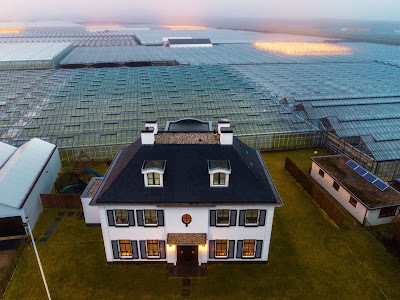 As the report says: "Although the SCF measure of wealth is fairly comprehensive, some assets that may be widely held, such as defined-benefit pension and Social Security wealth, are not included in net worth definitions because of the many assumptions required to estimate their values." Here's a table (a trimmed-down version of a larger table) from the report, showing some patterns of wealth. One big difference that jumps out is the difference between "median" and "mean." Median net worth for all US families is $97,300, while mean net worth is $692,100. Why such a huge gap? For those who last encountered those definitions some years ago, "median" is technically the value where half of the values are above and half are below. Mean is the average: that is, total sum divided by the number of people. When there are a small number of very high values, the mean will be much higher than the median. For an intuitive grip on the difference, imagine a three-person economy, where one person has $0 in wealth, one has $30,000 in wealth, and one has $3 million in wealth. The median here would be $30,000, with equal numbers of people above and below that value. The mean would be $3,030,000/3, which would be $1,010,000. As the table shows, it's broadly true that those who are older or who have better education levels also tend to have higher net worth. However, mean net worth does tend to diminish just a bit for the older age groups, which makes some sense if that group is consuming wealth and passing it wealth to younger groups. 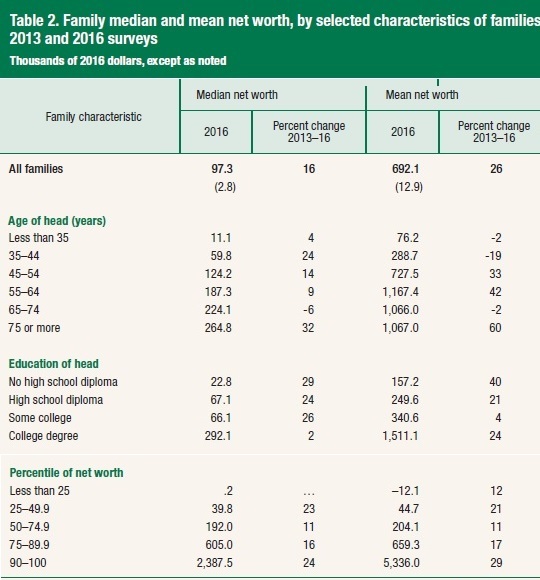 The bottom half or so of the American population has relatively little in net worth, but it's not obvious from this table how big a problem that is. After all, one would expect most people in their 20s to have little net worth, and even people in their 30s who potentially have big home mortgages and high student debts might not have high net worth. The more troublesome groups, which are not the focus of this overview report, would be those in their 40s who are not yet taking real steps to accumulating wealth, or those in their 50s and 60s who are approaching retirement but have not yet accumulated much wealth. Demographic shifts are about more than economics. Think about an array of social institutions: schools, parks, libraries, building and housing codes, public transportation, health care, the size of the volunteer sector. All of these, and many others, take on differing importance and shape when an economy has a relatively high number of children, or working-age people, or retirees. Deloitte has published the third edition of Voice of Asia (September 2017), with a focus on "Demographics fuelling Asia’s shifting balance of power." Here are some thoughts from the report. 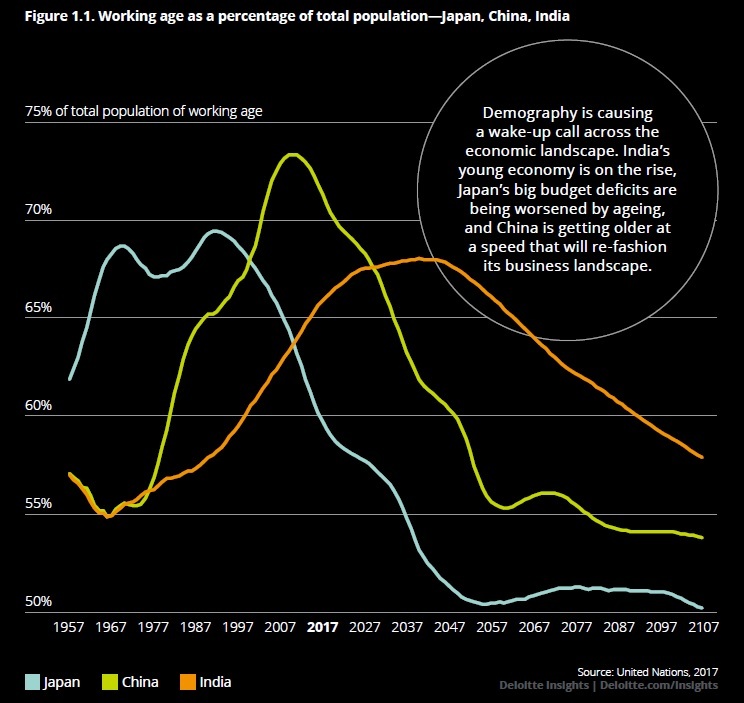 This figure shows the working-age share of the total population for Japan, China, and India. In Japan, this percentage rose and peaked during its period of rapid economic growth in the 1960s and 1970s. For China, the percentage rose in recent decades, and is now forecast to drop sharply. For India, the percentage is still rising. The report notes: "India will account for more than half of the increase in Asia’s workforce in the coming decade. The consequences for businesses are vast: An Indian summer is coming, and it will last half a century. 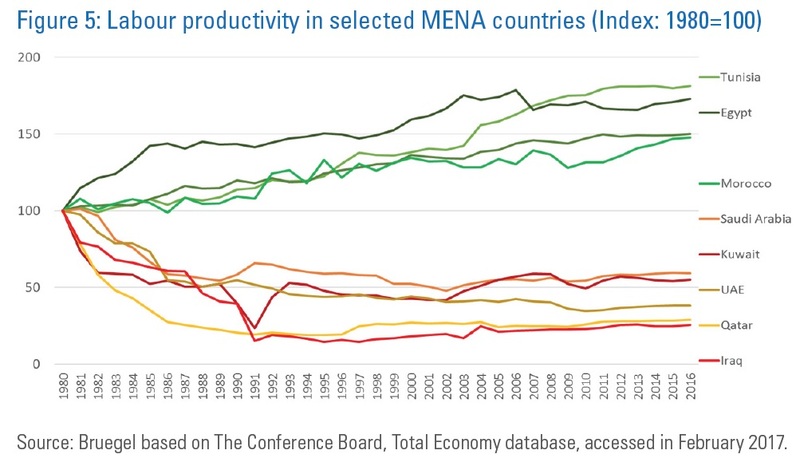 And while India’s rise might have the largest impact on the world, it isn’t the only economy set to surge, with Indonesia and the Philippines on track to enjoy similar trends. Both of these nations have a relatively young population, mainly because they still have birth rates in excess of the global average. This makes demographics a tailwind rather than a headwind for their growth across at least the next 20 years." Or to put it another way, the median age in Japan is 47 years; in China, 37 years; in India, 27 years. These are dramatic differences. 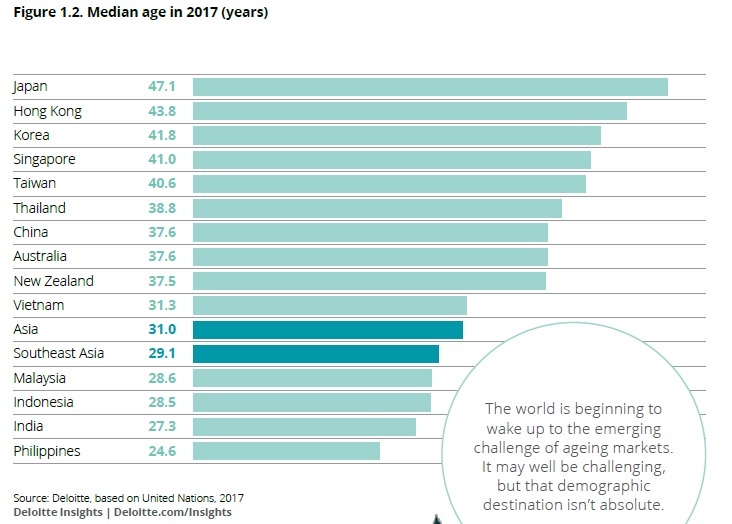 In the table, you can see where other Asian countries stand in terms of being older or younger. fully succeeds in getting rich." The political implications of that fact, given that the Chinese Communist Party has essentially been using economic growth as a justification for maintaining its hold on power, could be severe. If China, which by some measures is now the largest economy in the world, follows Japan's pattern of aging and economic stagnation, it will have a powerful effect on the growth rate of the global economy. Of course, there is no guarantee that the growth of India's working-age population will power economic growth. 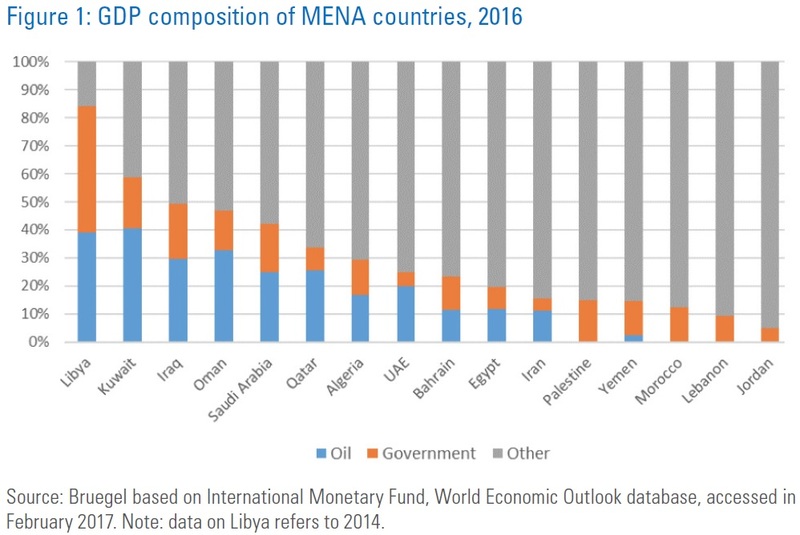 But there's a powerful opportunity for it to do so, if India can continue with economic and social reforms (for some discussion, see here and here). The global face of aging is going to shift dramatically in the next few decades. The report notes: "There are already more over-65s in Asia than there are people in the United States. 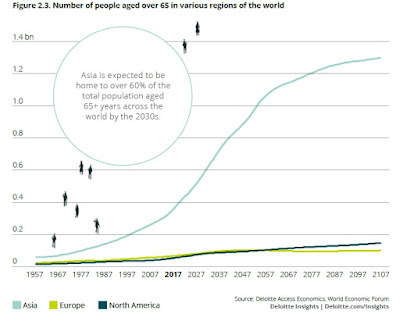 The number of over-65s in Asia will exceed one billion just after the middle of this century. 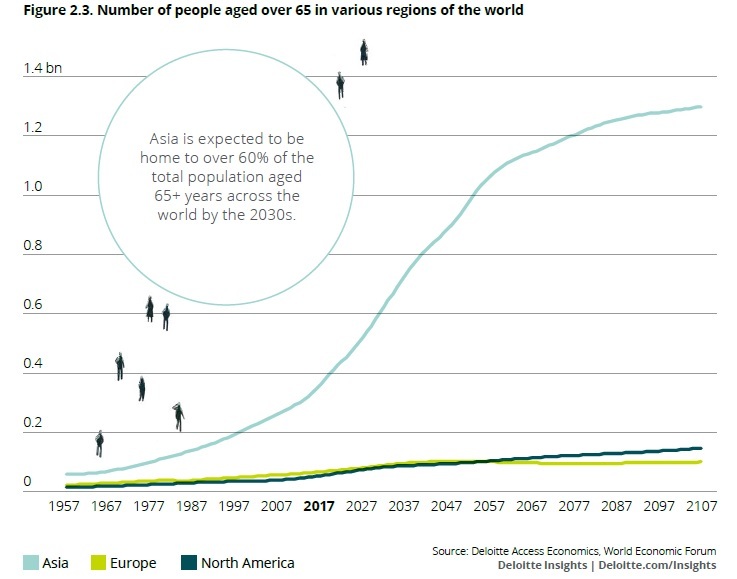 In fact, by 2042—in just a quarter of a century—there will be more over-65s in Asia than the populations of the Eurozone and North America combined. Yes, you read that right: More people aged over 65 in Asia than the total combined populations of North America and the Eurozone, and in just 25 years from now." Here's a figure to emphasize the point. 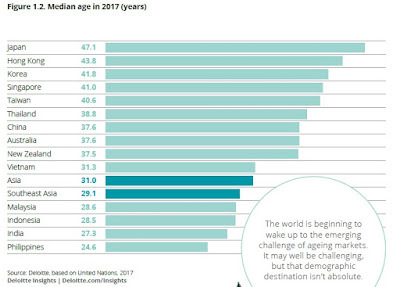 Europe and North America are aging. What's happening in Asia in the next few decades will be such a powerful demographic that it seems to require a stronger word than "aging." 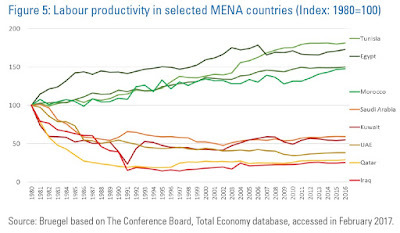 Two underlying patterns that will affect these workforce trends are migration and female labor-force participation. Countries like China or Japan, with low labor force growth, will face some economic pressures to allow greater in-migration. Japan, with relatively low female labor-force participation, will face pressures for that figure to rise. 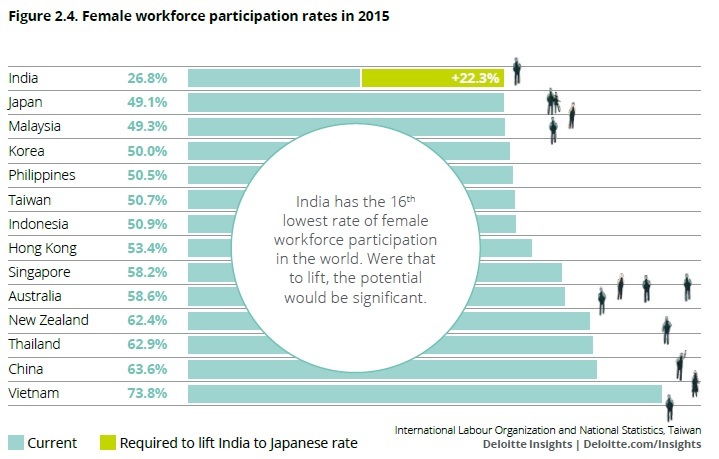 India has extremely low female labor-force participation, but if India wishes to take full advantage of its working-age demographic boom, this will need to change. Here are some female labor-force participation rates across Asia. It is of course not literally true that "demography is destiny," as an old saying has it, but it can matter a great deal for the growth rate and sectoral patterns of economies. 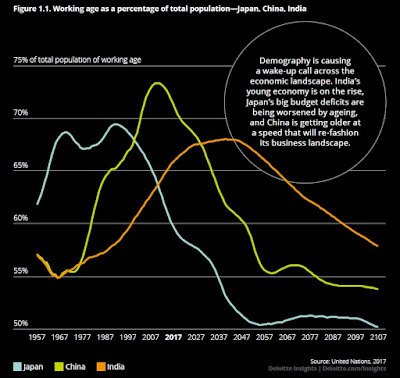 With China's working-age share of its population topping out and India's on the rise, we are at the hinge of a demographic transition that will reshape relative economic (and probably also political) power across Asia. of Child Labour: Results and Trends 2012-2016" that offers some useful facts and distinctions. It would of course be peculiar to count every employed child as a human rights abuse. For example, in 2016 the ILO counts 216 million children as "in employment." However, 151 million of them are counted in the more concerning category of "child labor," which is largely determined by the number of hours worked. For example, any child in the 5-11 age category who is "in employment" is also counted as "child labor." But children in the 15-17 age bracket need to work 43 hours per week or more to be counted is "child labor." Another subcategory is "hazardous work," which includes the physically or emotionally hazardous, along with the illegal. The figure shows the categories of "child labor" and "hazardous work" from 2000-2016. The steady decline over time is apparent. Of course, the numbers should not be taken as precise. "The 2016 estimates use data from a total of 105 national household surveys covering more than 70 per cent of the world population of children aged 5 to 17 years." It's easy to hypothesize about reasons why some countries might understate (to make themselves look better) or overstate (to attract international aid) or just not know (because of weak statistical apparatus) the level of child labor. But the overall downward trend is highly unlikely to be a result of some trend in survey bias. By region: "The Africa region and the Asia and the Pacific region together host nine out of every ten children in child labour. Africa ranks highest both in the percentage of children in child labour – one-fifth – and the absolute number of children in child labour – 72 million. Asia and the Pacific ranks second highest in both these measures – 7 per cent of all children, 62 million in absolute terms, are in child labour in this region." Effect of armed conflict on child labor: "The Africa region has also been among those most affected by situations of conflict and disaster, which in turn heighten the risk of child labour. The incidence of child labour in countries affected by armed conflict is 77 per cent higher than the global average, while the incidence of hazardous work is 50 per cent higher in countries affected by armed conflict than in the world as a whole." Most child labor is within families: "Most child labour takes place within the family unit. More than two-thirds of all children in child labour work as contributing family labourers, while paid employment and own-account workers make up 27 per cent and 4 per cent, respectively, of those in child labour. These numbers underscore an important broader point concerning the nature of child labour in the world today. Most children in child labour are not in an employment relationship with a third-party employer, but rather work on family farms and in family enterprises; understanding and addressing family reliance on children’s labour will therefore be critical to broader progress towards ending child labour." Child labor and forced labor: "According to the 2016 Global Estimates of Modern Slavery, there were about 4.3 million children aged below 18 years in forced labour, representing 18 per cent of the 24.8 million total forced labour victims worldwide. 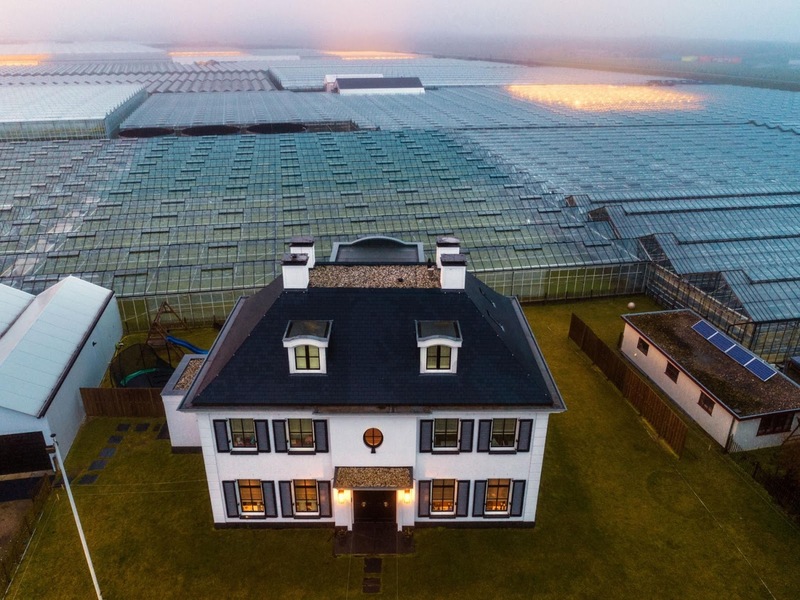 This estimate includes 1.0 million children in forced labour for sexual exploitation, 3.0 million children in forced labour for other forms of labour exploitation, and 300,000 children in forced labour imposed by state authorities." Child labor in agriculture: "The agricultural sector accounts for by far the largest share of child labour. The sector accounts for 71 per cent of all those in child labour and for 108 million children in absolute terms. Child labour in agriculture relates primarily to subsistence and commercial farming and livestock herding. It is often hazardous in its nature and in the circumstances in which it is carried out." By gender: "Boys appear to face a greater risk of child labour than girls. There are 23 million more boys than girls in child labour and 17 million more boys than girls in hazardous work. The gender gap increases with age. The difference in child labour incidence is less than one percentage point for 5–11 year-olds, rising to three percentage points for 12–14 year-olds and to five percentage points for 15–17 year-olds. But it is possible that these figures understate girls’ work relative to that of boys. ... Girls are much more likely than boys to shoulder responsibility for household chores, a form of work not considered in the child labour estimates. Estimates of children’s involvement in household chores, produced for the first time for the 2016 Global Estimates, indicates girls are much more likely than boys to perform household chores in every weekly hour bracket. Girls account for two-thirds of the 54 million children aged 5–14 years who perform household chores for at least 21 hours per week, the threshold beyond which initial research suggests household chores begin to negatively impact on the ability of children to attend and benefit from school. ... Girls are also more likely than boys to perform “double work duty”, meaning both work in employment and in household chores." The recommended policies to reduce child labor don't include any surprises. Make public schools available, and don't charge fees for them. Provide enough income support for families so it's not an economic necessity for children to work: some countries have moved toward "conditional cash transfer" programs that essentially pay families for the school attendance of their children. Challenge some existing social norms. In the extreme cases of hazardous child labor and forces labor, expose the practices and prosecute. But the bulk of child labor is family work in the agricultural sector, so that's where most of the progress needs to be made. When (not "if") the next recession arrives, the Federal Reserve will want to take action to stimulate the economy. In recent decades, this action has often involved cutting a certain targeted interest rate--the "federal funds interest" rate--by 3-4 percentage points. However, the federal funds interest rate is now in the range of 1-1.25%, and for a variety of underlying reasons, it seems unlikely that these rates will climb to the 4-5% range any time soon. Thus, central banks around the world are experimenting with nontraditional tools of monetary policy. For example, a number of central banks have pushed their own targeted policy interest rates into mildly negative territory, with what seems to be mild success so far. The US Federal Reserve, along with a number of other central banks, has engaged in "quantitative easing" policies in which the central bank buys financial assets directly. So far, the Fed has focused on Treasury debt and on mortgage-backed securities. But when the next recession hits, should the Fed think about buying government bonds? Thomas Belsham and Alex Rattan provide an overview of the issues that arise in making this choice, along with a review of what has happened since the Bank of England made a decision in August 2016 purchase up to £10 billion in corporate bonds, in their article "Corporate Bond Purchase Scheme:design, operation and impact," which appears in the Quarterly Bulletin of the Bank of England (2017 Q3, pp. 170-181). Why might a central bank decided to purchase corporate bonds at all, as opposed to other assets? If more parties in the market are willing to buy bonds--whether government bonds, corporate bond, or mortgage-backed securities-- it should be easier for borrowers to issue such securities. But Belsham and Rattan offer a few arguments as to why buying corporate bonds might have a bigger effect on the real economy than buying government bonds. For example, they argue that when a central bank buys investment-grade bonds, which are typically issued by larger companies, those large companies become more likely to obtain capital by issuing bonds and less likely to do so through borrowing from banks. In turn, this could cause banks to become more willing to lend money to medium-sized and smaller-sized firms. Another reason is that part of the risk in bond markets is that such markets are often not very liquid, meaning that it isn't always easy to buy or sell bonds right away--at least not without taking a hit on your desired price. But if the central bank is steadily involved as a buyer of bonds, liquidity in the bond market improves, and the risk of holding bonds diminishes accordingly. Finally, when a central bank buys corporate bonds, those who had previously been holding the bonds (or would have been holding the bonds) clearly have some appetite for the risks and returns associated with corporate activities, so they are likely to try to seek out some other ways to invest their funds into active corporate activities (rather than into lower-risk and safer investments). If a central bank decides to purchase corporate bonds, how can it keep the risk of doing so relatively low and avoid favoritism to certain industrial sectors or specific corporations? The Bank of England was willing to buy up to £10 billion in "investment-grade" corporate bonds (that is, relatively safe bonds, not high-yield, high-risk "junk bonds"). For comparison, the total amount of such bonds was about £500 billion. The goal of the BoE was to purchase these bonds without unbalancing the market. In a regular auction, buyers compete to purchase an item. However, the Bank of England purchased bonds with a "reverse auction," in which sellers compete to sell an item--in this case a bond--to the central bank. Thus, the Bank of England was agreeing to pay the lowest possible interest rates (and there was also a "maximum price" that the Bank would not exceed when purchasing any given bond). In addition, the Bank of England looked at how much of the £500 billion in bonds came from each sector of the economy, and took care to purchase bonds (tweaking the prices it was willing to pay just a bit as needed) so the Bank ended up owning bonds from each sector in the same proportion as these sectors were represented in the overall bond market. What were some effects of the Bank of England Corporate Bond Purchase Scheme? 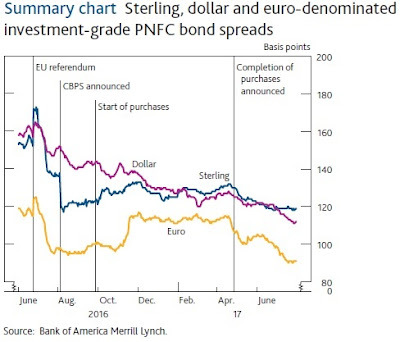 One quick-and-dirty way to evaluate the effects of this policy is to compare interest rates on corporate bonds of similar risk levels that are denominated in US dollars, euros, and pounds. If one sees a drop in the interest rate for these corporate bonds around the time the policy starts, a drop which isn't mirrored in the other markets, it suggests the policy had some effect. 10 basis points in the days that followed. 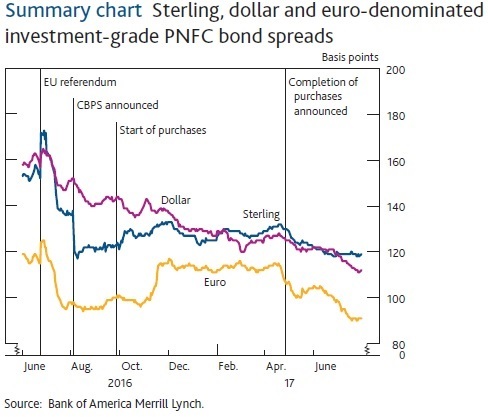 Issuance in sterling by UK PNFCs picked up sharply after the announcement, with the highest recorded monthly issuance of sterling-denominated investment-grade bonds in September of that year. Market intelligence also suggests that there was an improvement in liquidity in the sterling corporate bond market ... While the direct impact on the corporate bond market is encouraging, it is still too early to assess fully the transmission of the Corporate Bond Purchase Scheme to the real economy." What's the Bank of England plan going forward? The current plan is that as bonds make payments and mature, these amounts will be reinvested into other bonds. Thus, the Bank of England portfolio of corporate bonds is planned to remain at about £10 billion -- at least for now. This experiment is worth watching. If the US Federal Reserve feels a need during a future recession to carry out large-scale quantitative easing, the Bank of England process is likely to serve as a model. It would be interesting, and perhaps not in a good way, to watch the political pressure that would surely be exerted if the US Federal Reserve attempting to purchase corporate bonds in a way that doesn't intervene to favor certain parts of the bond market. 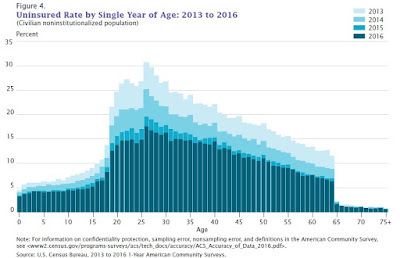 When I posted a couple of days ago on the most recent Census Bureau report about "Health Insurance Coverage in the United States," I didn't know that the Congressional Budget Office was about to come out with an updated set of estimates for "Federal Subsidies for Health Insurance Coverage for People Under Age 65: 2017 to 2027" (September 2017). Obviously, it's useful to consider the number of people with health insurance and the government subsidies at the same time! 1) Total US health care spending is about $3.5 trillion in 2017. For the present calculation, subtract out Medicare, which is about $700 billion. Thus, the total federal subsidies of $705 billion represent about one-fourth of non-Medicare health care spending. 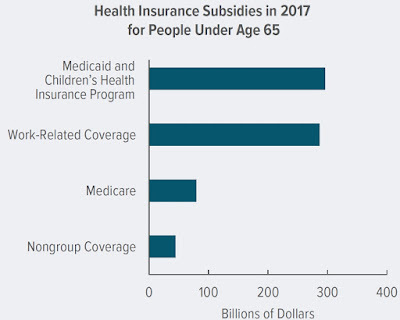 2) The Patient Protection and Affordable Care Act of 2010 increased these federal subsidies in 2017 by $117 billion: that is $72 billion for expansions of Medicaid coverage and $45 billion for subsidies involving the state-based insurance exchanges that are called the "Basic Health Plan." 3) The federal government subsidizes employer-provided health insurance to the tune of $279 billion in 2017 by treating it as an untaxed fringe benefit. The single largest method through which Americans get their health insurance continues to be employer-based coverage. 4) The Patient Protection and Affordable Care Act of 2010 expanded Medicaid enrollment by about 13 million people, and another 8 million have received subsidies for purchasing insurance on the state-level exchanges. 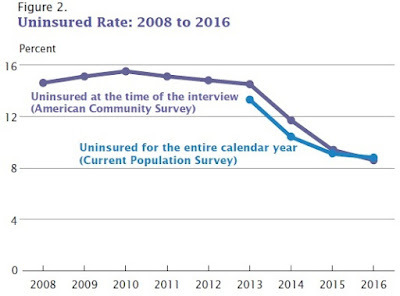 5) It's a little tricky to calculate how much the Affordable Care Act of 2010 expanded coverage. For example, if some employers decided to stop providing health insurance with the idea that their employees could turn to the state-based health insurance exchanges, one would need to take those effects into account. 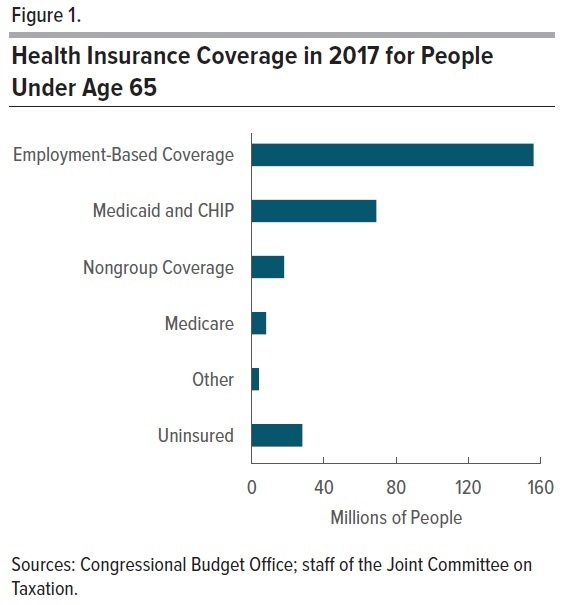 But as a back-of-the-envelope estimate, one could reasonably say that the Affordable Care Act provide health insurance for about 21 million people, with a corresponding increase in federal health care subsidies of $117 billion. 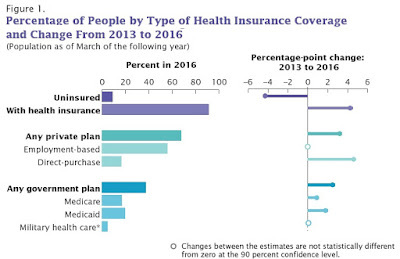 Thus, the average cost of person of expanded health insurance coverage has been about $5,500. As I've written before, there was never any mystery in how the 2010 legislation expanded insurance coverage: if the federal government was willing to spend an extra $117 billion, it could provide insurance coverage for another 21 million people. people would be unauthorized immigrants and thus ineligible for subsidies through a marketplace or for most Medicaid benefits; about 10 percent would be ineligible for Medicaid because they lived in a state that had not expanded coverage; about 20 percent would be eligible for Medicaid but would not enroll; and the remaining 40 percent would not purchase insurance to which they had access through an employer, through the marketplaces, or directly from insurers." 7) For ll the controversy surrounding the 2010 health care legislation, both at the time and since, it was essentially incremental. For most Americans with health insurance--most of those with employer-provided plans, Medicare, or already eligible for Medicaid--the 2010 act did not disrupt their health insurance in any substantial way. "Rationality is an Assumption I Make About Other People"
Self-aware people recognize that they sometimes act irrationally. So how can self-aware economists assume that other people act rationally? Here's how David D. Friedman answered that question in his 1996 book Hidden Order: The Economics of Everyday Life (pp. 4-5). "Suppose someone is rational only half the time. Since there is generally one right way of doing things and many wrong ways, the rational behavior can be predicted but the irrational cannot. If we assume he is rational, we predict his behavior accurately about half the time--far from perfect, but a lot better than nothing. If I could do that well at the racetrack I would be a very rich man. “One summer, a colleague asked me why I had not bought a parking permit. I replied that not having a convenient place to park made me more likely to ride my bike. He accused me of inconsistency. As a believer in rationality, I should be able to make the correct choice between sloth and exercise without first rigging the game. My response was that rationality is an assumption I make about other people. I know myself well enough to allow for the consequences of my own irrationality. But for the vast mass of my fellow humans, about whom I know very little, rationality is the best predictive assumption available. "One reason to assume rationality is that it predicts behavior better than any alternative assumption. Another is that, when predicting a market or a mob, what matters is not the behavior of individuals but the summed behavior of many. If irrational behavior is random, its effects may cancel out. "A third reason is that we are often dealing not with a random set of people but with people selected for the particular role they are playing. If firms picked CEOs at random, Bill Gates would still be a programmer and Microsoft would have done a much worse job than it did of maximizing its profits. But people who do not want to maximize profits or do not know how are unlikely to get the job. If they do get it, perhaps through an accident of inheritance, they are unlikely to keep it. If they do keep it, their companies are likely to go on a downhill slide. So the people who run companies can be safely assumed to know what they are doing--generally and on average. And since businesses that lose money eventually shut down, the assumption of rational profit maximization turns out to be a pretty good way of explaining and predicting the behavior of firms." Renee Haltom interviews Jesse Shapiro on the topic of media bias and political bias in Econ Focus, published by the Federal Reserve Bank of Richmond (2nd Quarter 2017, pp. 24-29). The entire interview is worth reading, but here are a few points that caught my eye. The headings are my words, and the explanations are Shapiro. Newspaper political bias is more likely to reflect readership, rather than bias of owners. "What we found is that newspapers with a more Republican customer base are much more Republican than newspapers in more Democratic markets. And once you control for geography, there's very little evidence of an influence of owner ideology — whether you measure that by the positions of the other newspapers owned by that owner or by the owner's donations to different political parties. There really isn't much evidence that the owner plays a big role in how a newspaper slants the news. There is less ideological segregation in online media than you might have thought. "Think of an online news outlet, like a blog, as a neighborhood, and let's measure who's in that neighborhood: What fraction of those people would self-identify as conservative? What fraction would self-identify as liberal? And let's calculate how segregated is this universe, how segregated is the Internet. To what extent are people visiting news sites that are only populated by other people like them ideologically? "We found that the extent of segregation on the Internet is surprisingly low. It's certainly true that people gravitate to like-minded sources. So for example, foxnews.com has a more conservative audience than nytimes.com. "But the Internet is not radically different from traditional media. Take the fraction of the audience on a given news site that is conservative and call that the conservativeness of the site. Then take the website visited by the average conservative on the average day — that website is about as conservative as usatoday.com. Now do that same thing for the average liberal, that's about as liberal as cnn.com. If you were to read those two outlets, you wouldn't find that they're radically different. "In fact, we find that isolation is very rare in the data. We have individual-level data on users on the Internet. People who get all of their news from outlets to the left of, say, the New York Times are very unusual. Likewise, people who get all of their news from sites to the right of Fox News are extremely rare. Folks that go to a fringe conservative site like rushlimbaugh.com are more likely to go to nytimes.com than readers of Yahoo News. The people who are consuming niche media are probably pretty politically engaged people, and therefore they want to read a lot of things. So in the end, the picture is a lot more muted than what people have feared." Use of online news and social media is not correlated with political polarization. "We just compare trends in polarization for groups of people that have high or low propensities to use the Internet and social media. Our favorite and most important comparison is with respect to age. People who are 75 years and over rarely use social media and don't report getting a lot of political information online. People who are 18 to 25 frequently use social media and report getting a lot of political information online. So if you thought that social media was contributing to the rise in polarization, what you would expect to see in the data is that polarization is rising especially fast for younger Americans — and if anything, the story is the opposite. The rise in polarization is similar between the relatively old and the relatively young, and if anything, maybe polarization is rising faster among the relatively old. So in that sense the data don't line up with the hypothesis that social media is driving the rise in polarization. 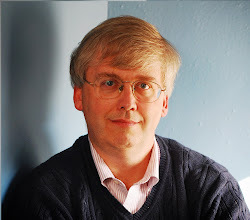 "I think the effect of the Internet on polarization remains an open question. We're arguing that it doesn't appear that social media is accounting for the increase in polarization, but we haven't offered a constructive account of what is driving it. Until we have a better understanding of that, it's hard to rule anything out." Political phrases have become more specialized and identifiable by party affiliation over time. "So what we did is try to figure out, for every session of Congress and every point in time, how easily a neutral observer could tell whether someone is a Republican or Democrat based on how they talk. We took the entire Congressional Record and used computer scripts to turn it into quantitative data about the use of phrases. Then we took the counts of phrases by every speaker and every session of Congress back to the 1870s and fed that through a model of speech. The model can tell us, at every point in time, how informative your speech is about your party. "What we find is that in the 1870s, if I give you a minute of random speech from somebody in Congress, you're going to guess his party correctly about 54 percent of the time, only modestly higher than chance. In the late 1980s, you'd be doing a little bit better, but barely. By the 2000s, the number is closer to 75 percent. Something enormous changes between the late 1980s and the 2000s to cause the parties to diverge tremendously in how they're talking — many more phrases like "death tax" and "estate tax." "The timing of the change coincides with the "Contract with America" and the Republican takeover in the 104th Congress in 1994. That was a watershed moment in political marketing. It showed the power of language to frame a set of issues and craft a narrative that could be very powerful in winning elections and changing policy views. In the wake of that, strategies on both sides crystallized around trying to have a very consistent message and use very consistent language to try and influence how voters saw the issues. I think that's what's reflected in the data. "In terms of implications, one speculative possibility is that the fact that Republicans and Democrats are speaking differently to each other might contribute to hostility. It might make it harder for them to find common ground or recognize positions on which they do agree. That's not something that we show in the study, but that's one not-so-optimistic possibility suggested by it."